This is the final post in the What to Cook for Dinner Series! 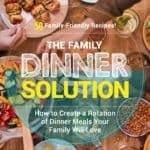 I’m ready to celebrate the release of my new book: The Family Dinner Solution: How to Create a Rotation of Dinners Your Family Will Love (previously published as What to Cook for Dinner with Kids). 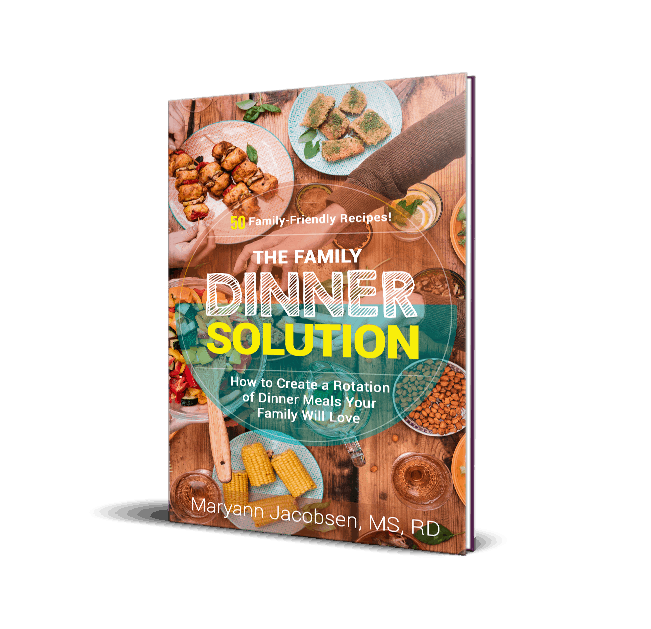 The book details my process of simplifying and strategizing my dinner meals, giving readers plenty of ideas on how to do it themselves. 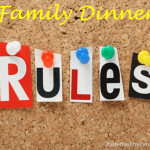 What to Cook for Dinner also includes over 50 recipes that I have perfected since running my 30 Meals in 30 Days Challenge. While it’s not okay to give away the end of fiction books, nonfiction is different, right? The book ends asking readers to consider making their own cookbook. This is the stage I am in now: giving my Tried and True dinner recipes a nice home that I can easily access. When you’re ready to actually make your own cookbook, you are in a good place. That means you have enough meals to be excited about and rotate for good variety. With your own cookbook in hand, you can take back all the energy that used to go into agonizing over what to cook for dinner. I know this purposeful way of cooking has greatly improved my family’s quality of life, and I hope it has done the same for you. I had been eying make-your-own cookbook companies for some time. I liked many of the products but felt limited by the permanency of them. What if I wanted to remove or add a new recipe? Even the books that allow for removing and adding recipes need a special order to add a new recipe. So after more searching, I found the Cookbook People. They are a family-owned operation specializing in recipe keepsakes. I immediately fell in love with their products and knew that this is the place where my recipes will live. 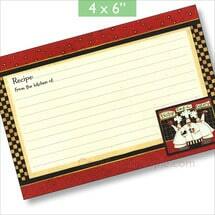 Recipe Binders: You can choose between half page or full page length. I went for the full page. 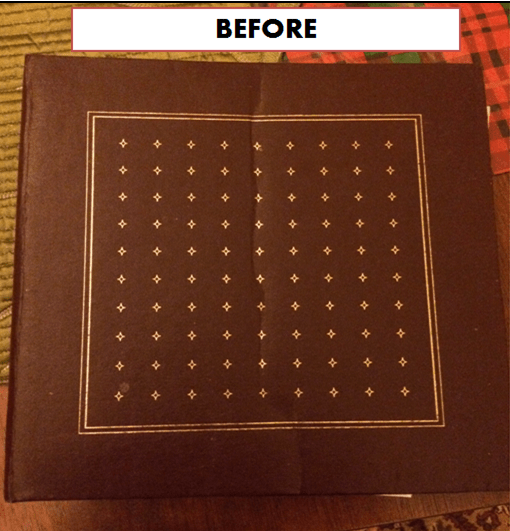 It was so nice to upgrade my binder. They also allow for personalization. 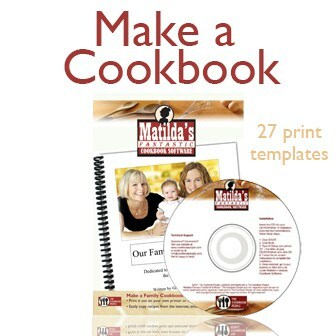 Cookbook software: Their software makes it simple to copy and paste your recipe, add a picture and print it in a pretty format. Really, really easy to use. 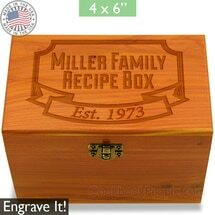 Recipe Cards and boxes: If you prefer writing recipes on cards they have beautiful 4×6, 3×5 and 5×7 cards and really cute boxes to choose from. You can engrave the boxes with your name or anything else you want! Other stuff: Don’t miss all the other cooking-related items they have, like Ipad stands if you prefer to store your recipes online or in an app. Search their site to see what they have to offer. I approached the Cookbook People and told them about my book and that I wanted to do a giveaway. They graciously offered for me to try their products for free and extended a gift to my readers. Two lucky winners will be able to choose $50.00 worth of product from the Cookbook People ($100.00 total). This giveaway is now closed. Thanks for going on this ride with me. When you feel stuck, come back to this series or the book for inspiration and ideas to get back on track. This is a goal of mine for 2016. I am constantly giving up on finding something everyone in my house will eat for dinner without cooking the exact same thing every night. We often end up going out because I can’t face it. I am a subscriber to the blog through Bloglovin! My recipes are a huge bundle of papers in a giant stack. I can never find anything easily. I would love to get organized with this tool!!! Currently reading your book and loving it! I have tried and true recipes in several different places so winning this would allow me to have them in one spot! I also subscribe to your blog! Love it! I currently have several file folders worth of recipes. Would love to get them into usable shape and into the kitchen! Hopefully before child #2 arrives in March. 🙂 I am subscribed to your email list (and on FB). Thanks! This is a great giveaway! Thanks, Maryann! I love a good party! I just downloaded the free trial of the cookbook software, I have high hopes for the full version! 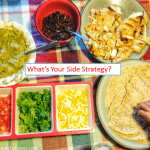 Your blog has been a great inspiration to try new meals and how to update old favorites. I can’t wait to see the book! I would LOVE to win this because I too am a dietitian who works with kids and I have been considering making my own cookbook for to help my patients and their families visualize healthy eating! This would make it so easy! I never knew about this company and am excited to try their products! Thank for for always giving such great resources to your readers! I am already a subscriber, by the way! Thanks again! Wow, what an incredible giveaway! I LOVE that software and would use that! I have so many recipes clipped out, printed out and my cabinet looks like a book threw up with all the paper awray! I would love to win because I missed the 48 hour window of getting the book for free. Thanks for the opportunity! This prize looks great, having gone back to work this year with two fussy young kids our meals are very repetitive. Having something like this to keep everything together may help with meal planning and adding more variety to expand my boys repertoire. I would love to in win because I am planning on starting my own family soon! I keep waiting for my picky eaters to outgrow their picky-ness but they just aren’t. I’ve tried every trick in every book I’ve found. I love the ideas on your blog… and I can’t wait to see the new ideas in the book! I’d love to win because that would be a Merry Christmas – Happy Festivus – Happy Life Day to ME! Hello, I’m a subscriber and I’d like to win because my recipes are stuck on my phone and I would prefer to cook from a book but haven’t gotten around to writing everything out. 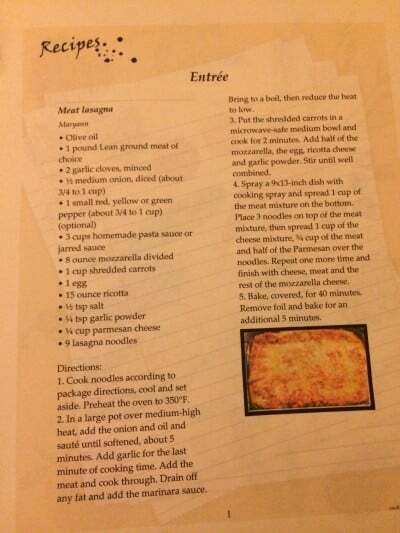 The option to copy and paste the recipes and have them printed out sounds much more appealing. Two years ago I compiled at family cookbook for the 5 children and their extended families. I had everyone submit our own family favorites and ones they have added over the years. It was a surprise birthday gift for a sister turning 60 that year. We has a blast creating it and using the other parts of the program for bio and addresses. My laptop crashed earlier this year and I’m not sure I have it on an external hard drive, but I am sad that all that work is lost. I will try adding the software again and checking the drive for the files. I am now a subscriber. Wahoo!! I would love to win this. 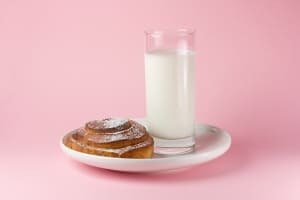 I have two sons, one with special needs, who is an extremely selective eater. I am already a subscriber to your email list and your Blog. I love collecting recipes. I’m sure there’s “buried treasure” in my collection but I can’t always find it. Am I looking for an attractive tool to get organized? Yes, please! I’d love to win because they have some really great products on their site. I could find lots of great gifts for the cooks in my family! What a great idea! 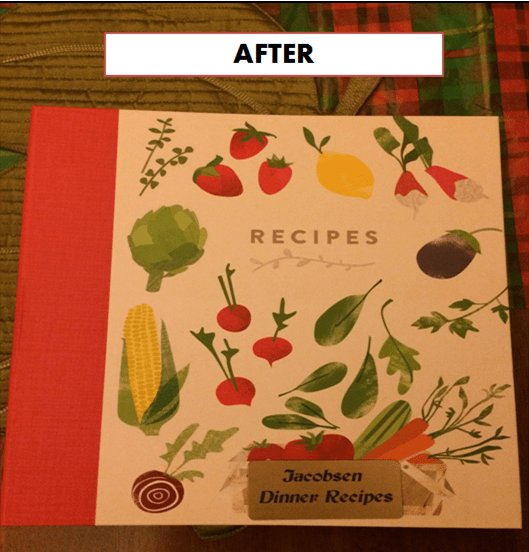 I keep my favorite recipes in several places, it would be great to organize them in one go-to book or box! 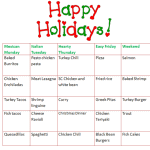 I do my best to meal plan, but we often end up eating a lot of he same things every week. It is easier to just make what everyone likes! I love to look for new recipes, but organizing them is always a challenge! I just subscribed to your blog. I look forward to reading it!